Fossils from a young Tyrannosaurus rex, once displayed along with this recreation of the dinosaur skeleton at a University of Kansas Museum, are now up for sale. 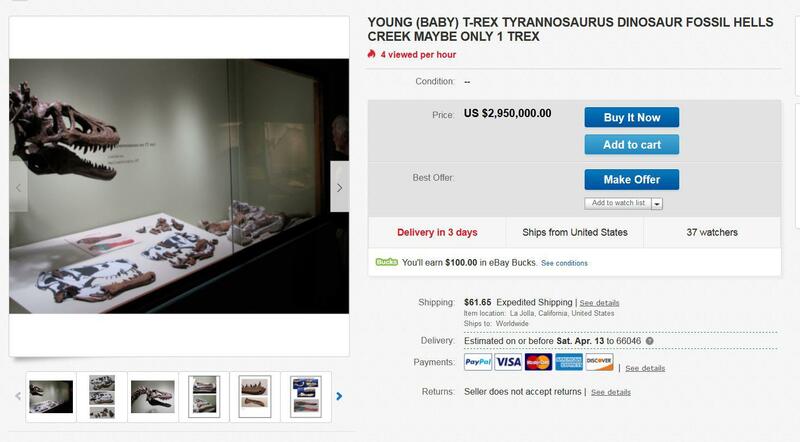 “This young REX is currently on display at the University of Kansas MUSEUM of Natural History,” the eBay listing originally read. It also said a research paper was forthcoming. There’s a “baby T. rex” on eBay with a $3 million price tag, advertising that the fossil is at @kunhm and getting a technical writeup as part of the sales pitch. “As an alum, I am disappointed to see the state's most important natural history museum acting as a shill for commercial fossil sales,” Patricia Holroyd said on Twitter. Museum leaders said the organization had nothing to do with the listing. That specific T. rex was, in fact, never owned by the museum. The fossil had been loaned to KU by Alan and Robert Detrich in late 2017. The fossil stayed on display under the agreement that KU would take it down when it was sold. The agreement said the museum would not promote the sale or have any association with it. “Our intent was to keep the specimen in the museum sphere to be enjoyed by visitors until it was sold to a museum,” Krishtalka said in a message to department staff. But then, the fossil was abruptly listed on eBay without notice. The eBay listing for the dinosaur fossil once displayed at a KU museum. “The eBay listing referenced the KU Natural History Museum, which made it appear as if we were promoting the sale, and which was in violation of our contract,” he said in the message. After the listing was posted, the museum took the T. rex display down. Museum officials asked that the reference to KU be removed from the listing and it was taken off the eBay page. KU paleontologists have worked to excavate juvenile T. rex fossils in Montana. Krishtalka said KU researchers have studied a different juvenile T. rex specimen the museum owns.